Angola Field Group presentations, all ages are welcome! Angola Field Group members Yuri and Benjamin selling items before a presentation. 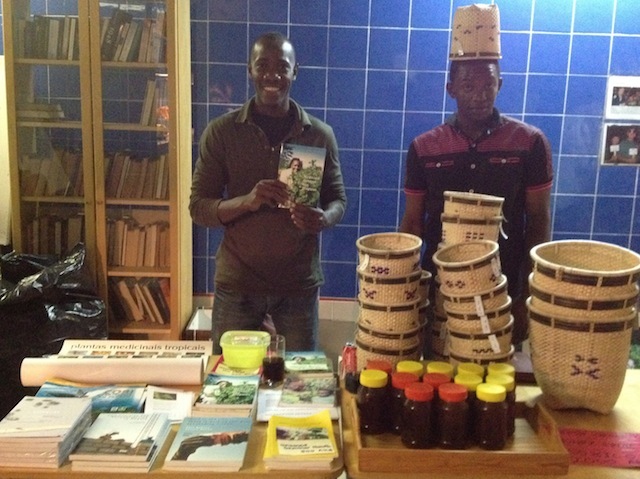 For sale: handcrafted baskets and organic honey from Moxico; books and literature published by Development Workshop and Action for Natural Medicine (ANAMED); illustrated children’s book about saving turtles in Angola titled Cori A Tartaruga Em Perigo, signed by the author. Established in 2002, the Angola Field Group is an informal organization open to expatriates, Angolans, and anybody who wants to learn more about Angola. Based in Angola’s capital city Luanda, the Field Group hosts monthly presentations that cover a variety of topics from the environment to history to social issues to culture. In addition the Field Group offers one field trip per month, either a day trip or overnight trips, with carpooling options for participants without their own vehicles. Scroll past the photo for a detailed history of the Field Group. Our monthly presentations are carried out in close cooperation with the Viking Club at the premises of the Viking Club in the Maianga building. View our Join Us page for a map and directions to the Viking Club. To become a member, attend a meeting or email AFG organizer Henriette Koning at angolafieldgroup@gmail.com. Members are notified by email of upcoming events. There are no membership fees or fees to attend the presentations or for most day trips. Field group members in Catete Town. In February of 2002 the rebel leader Jonas Savimbi was killed. In April, 2002 the peace treaty was signed and Angola was officially at peace. In October, 2002 the Angola Field Group had its first trip – we went to the province of Kwanza Sul with 4 vehicles and 14 people. This soon after the war, tourist journeys were unheard of and the roads were practically deserted on this first trip. In Kwanza Sul we stayed in an old coffee fazenda, on beds and camped out in sleeping bags. 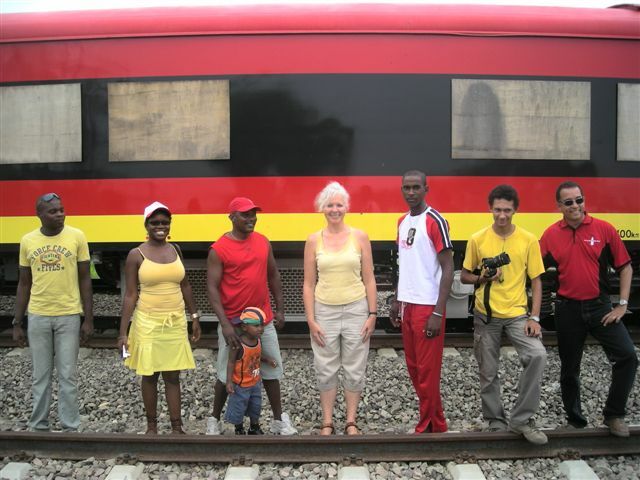 After two years of being ‘house bound’ in Luanda it was exhilarating to get out into the countryside and inspired our second field trip, this time to Kissama Park, in December 2002. At that time the park had just been inaugurated with animals brought in and there were very few tourists. These two field trips were taken with a variety of people: Americans, Australians, Filipinos, Dutch, South Africans, British, and Canadian expats, who like me reveled in getting out of the city and learning about the countryside. Angola, probably because of its Portuguese heritage, has very little information available in English. We were anxious to learn more about the country and disappointed in the lack of books and magazines available in English.We originally met for presentations in what used to be an outdoor crèche in the small compound in Vila Alice and people had to bring their own chairs.We borrowed a sound system from the university and thus was born the presentation part of what is today the Angolan Field Group. We started off with 40 people invited to the first talk and today have an email list numbering over 500 addresses and we generally have over 150 people at the talks. Since that first presentation on August 18, 2003, we were invited to move to the Viking Club, which has been around for over 15 years, a little informal bar that is open every Thursday and is set up in the mezzanine of what used to be the United Nations resident apartment building, in Maianga. For a map and directions click here. Through our field trips and presentations, the Angola Field Group has acted as a launch pad for a variety of books, CDs and DVDs including the English version of a DVD called Saudades and a DVD by Richard Pakleppa illuminating the problem of discrimination against the San people. The Field Group also started the Sponsor a Shepherd program for Pedro Vaz Pinto’s award winning Giant Sable/ Palanca Negra Project. Every year for over 4 years the Field Group has done an overnight turtle watching trip, which raises funds and and awareness of their plight. 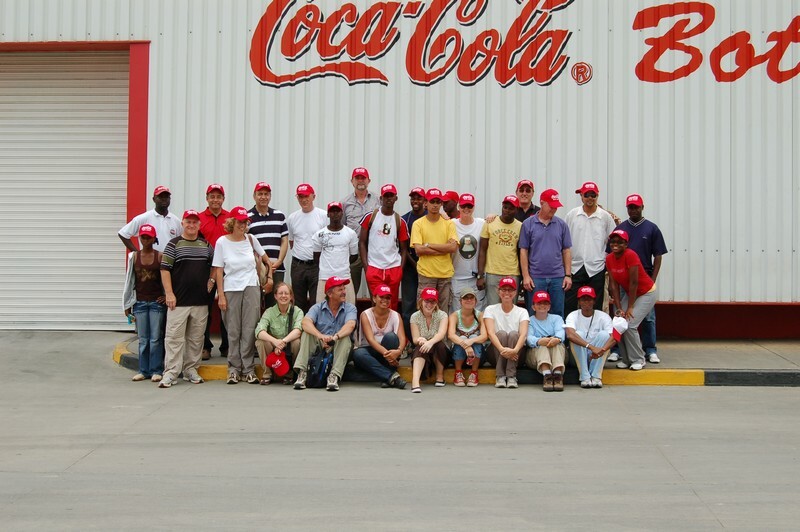 Field group visits the town of Bom Jesus and its Coca Cola plant. Photo courtesy Rebecca Peters. angolafieldgroup.com and all photos on this website, unless otherwise indicated, are © Henriette Koning.